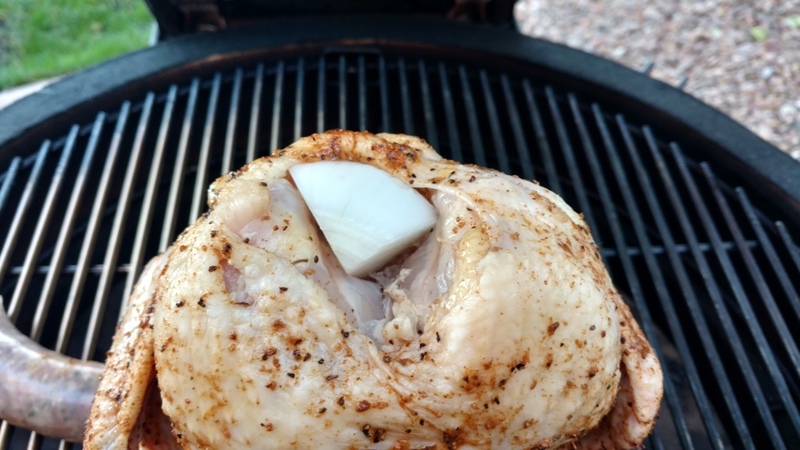 Beer can chicken is one of the quickest and easiest ways to cook delicious smoked chicken. 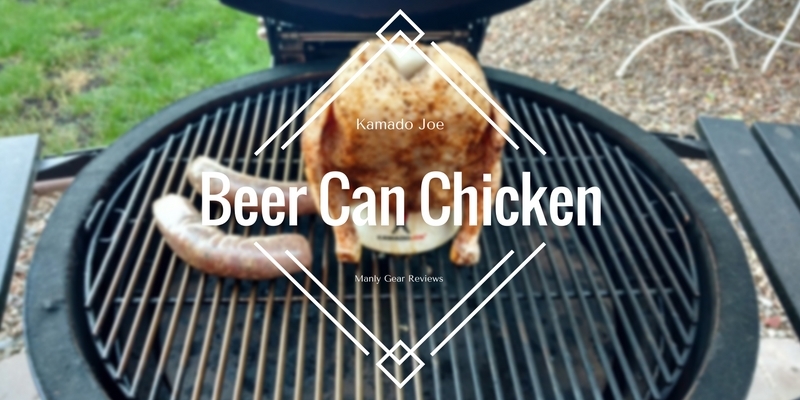 If you recently picked up a Kamado style cooker and are looking for an easy, quick first cook, look no further than doing some beer can chicken. Beer can chicken is a way to cook chicken that allows the cook to smoke the chicken while the inside is getting steamed with beer and other goodies that you mixed in the beer. The result is a supremely moist chicken that is bursting with flavor and sure to be a family favorite. To start, you need to get your grill lit and preheated to 275 – 330. I use Kamado Joe starter cubes for this. 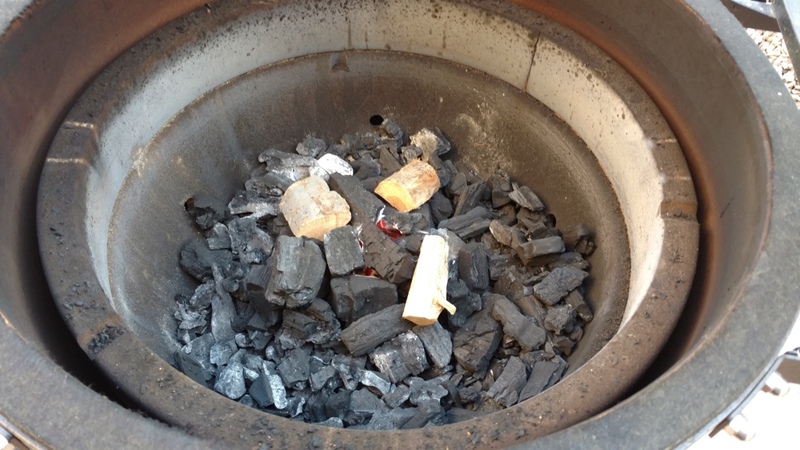 Once the grill is lit and has a nice ember going I throw a couple chunks of apple wood on. 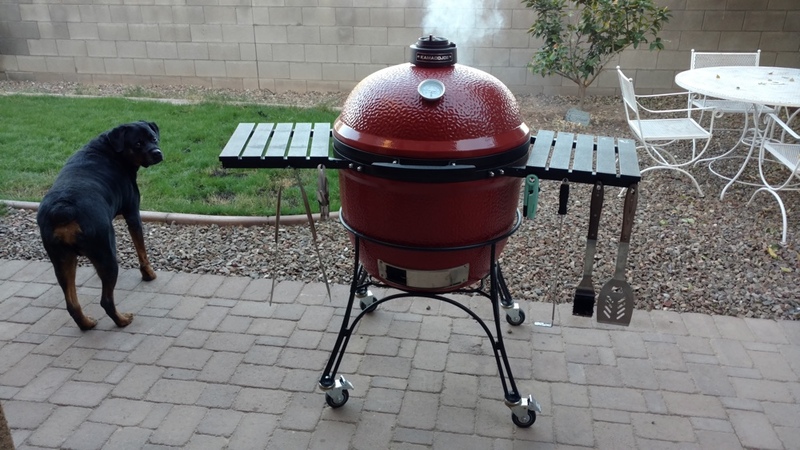 Then install the racks and heat diffusers and close the lid to allow the grill to get up to temp. Next, start on the chicken. Pull out all the fun stuff from the inside. After you do this you are going to want to carefully pull back the skin so you are able to sprinkle your favorite rub directly on the meat. After you do this make sure to pull the skin back in place and liberally cover it in your rub as well. 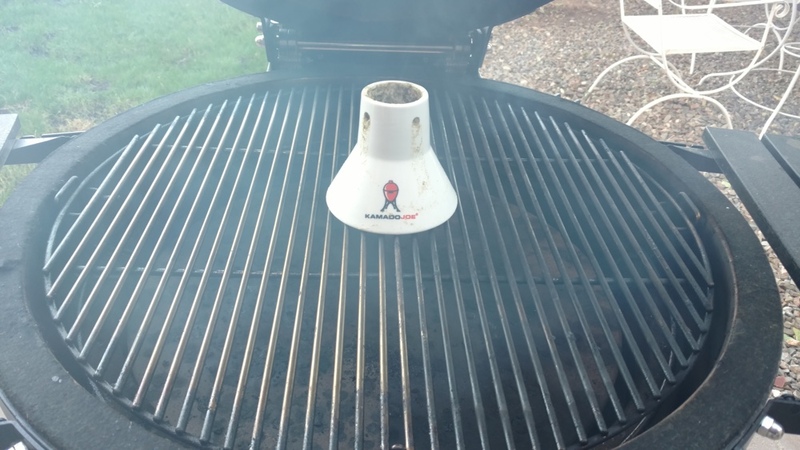 After you take care of the chicken, lets do final prep for the grill and the Kamado Joe chicken holder. Throw about a teaspoon of both thyme and garlic powder into the chicken holder. 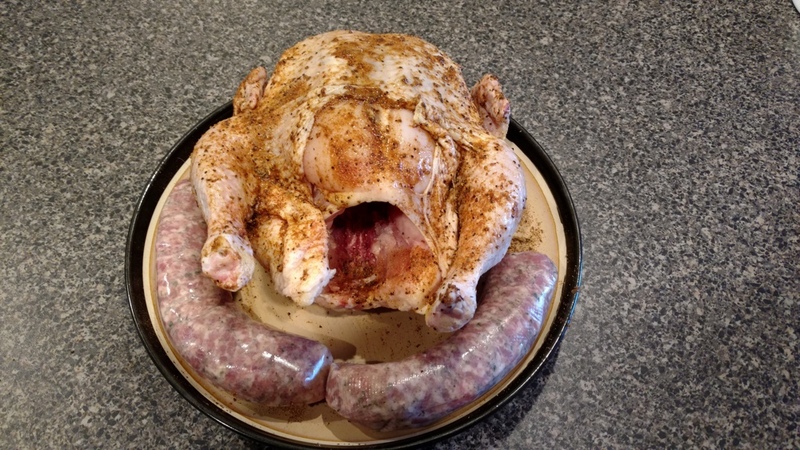 Proceed to pour about 15oz or so of beer into the chicken holder and place directly onto the grill rack. 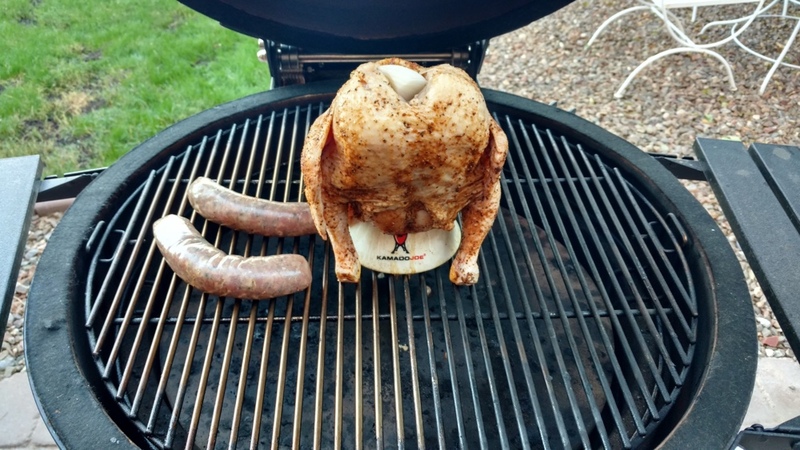 Give the beer can or chicken holder about 10 min to come up to temp with the lid closed. After allowing the temp to come up on the chicken holder, go ahead and slide the chicken onto holder. Don’t forget to plug the neck with that onion wedge! Many have wondered by the onion wedge? I’ve found that it can act as a plug of sorts to help all that moisture stay in the chicken longer. You can certainly skip this step if you want but I’d recommend giving it a try at least once! After you set the chicken and whatever other meats you plan on smoking, go ahead and close the grill. Depend on the size of your bird and if you went lower or higher on the temperature spectrum for your cook, expect a total cook time of 1 to 2 hours. If you are doing brats like I did, you will need to take them off approximately after 40 min to 1hr…which I did not do. Oops. What we are shooting for is an internal temperature of around 162-165 in the thickets part of the breast. When you are getting close to this temperature range you can do a couple things depending on how much your family likes the skin. Once you are in the low 150’s you can open that bottom vent to bump the temp to a tad over 400. This will crisp up that skin nicely and make for good eats. Otherwise just ride it out until you hit 162-165 and pull it off. Not the most glamorous shot but it’ll have to do. 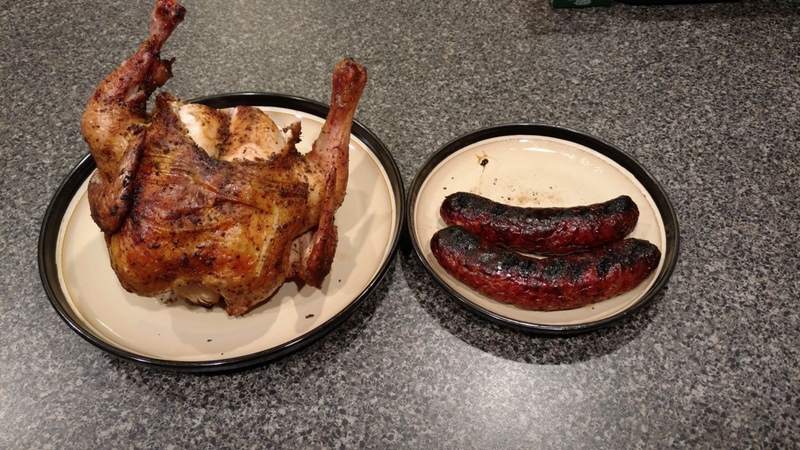 Brats overstayed their welcome on the grill by about 30 min…that was my fault. The chicken however, turned out fantastic.